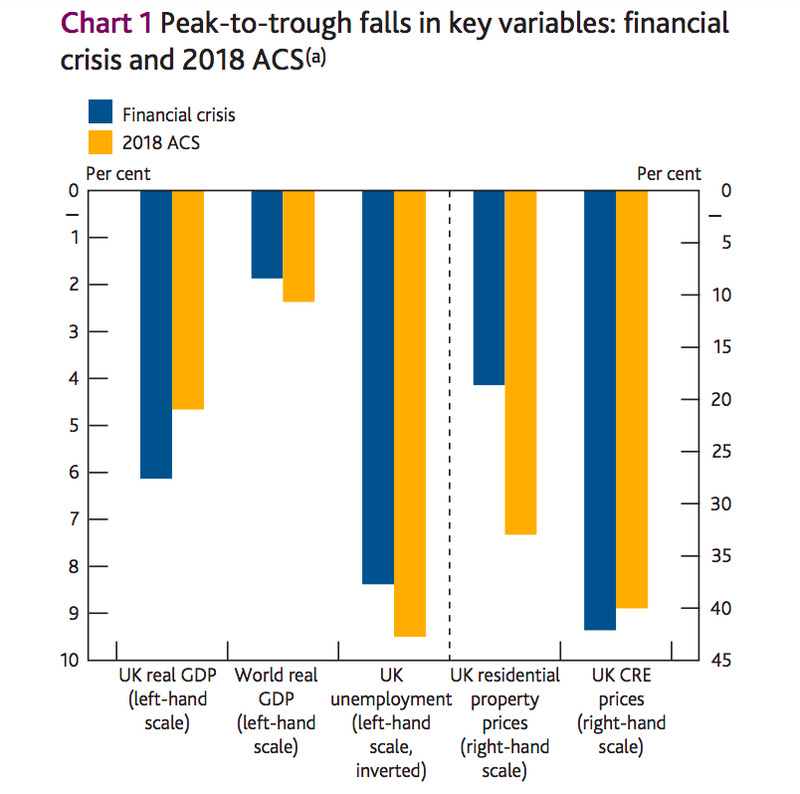 Bank of England releases 2018 stress test scenario, designed to test British banks’ ability to withstand negative shocks. “Overall, the 2018 stress scenario is more severe than the financial crisis,” the Bank of England said. LONDON – The Bank of England on Friday released the scenario it will test Britain’s banks against this year to ensure they are resilient enough to resist a major negative shock to the global economy. The test is designed to ensure that banks are in possession of right tools – such as sufficient liquidity and relatively strong capital positions – to weather an economic storm. The main points of the test are effectively a collapse in the world economy, an even bigger collapse in the UK economy, a huge drop in house prices, and a massive increase in both unemployment and the Bank of England’s base interest rates. “The stress scenario incorporates a synchronised global downturn in output growth. Relative to the baseline scenario, growth in China, Hong Kong and Singapore is particularly adversely affected,” the BoE said on Friday. “Investors’ risk appetite diminishes and financial market participants attempt to de-risk their portfolios, generating modest safe-haven capital flows and substantial increases in risk premia in financial and property markets. In 2017, for the first time since the Bank of England introduced the stress test, all of the UK’s major banks passed. “For the first time since the Bank of England launched its stress tests in 2014, no bank needs to strengthen its capital position as a result of the stress test,” the Bank of England said in a statement at the time.